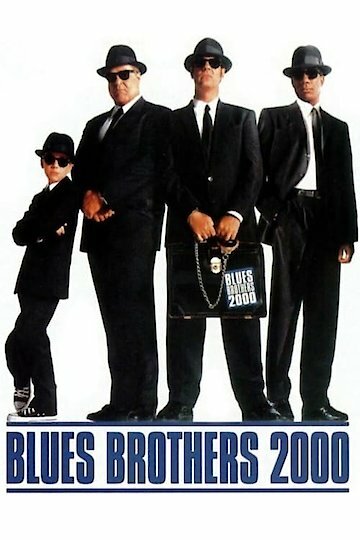 The Blues Brothers 2000, a comedic-musical, stars Dan Aykroyd as Elwood Blues and John Belushi as Joliet Jake Blues along with a star-studded cast of musicians and singers. The storyline plot has John Belushi being released from prison and picked up at the gates by his brother and old blues band partner, Dan Aykroyd. From there the brothers learn the Catholic orphanage where they grew up is in dire need of $5000 to stay open. They owe the orphanage and set out to round the old band up to perform a concert to get funds for the children's home. The movie includes chase scenes as the police from various agencies chase the Blues Brothers and a neo-nazi group joins in the chase. Besides bad guys and police chasing them, there is a woman, Carrie Fisher, from Jake's past trying to kill him. Some of the chase scenes take place in downtown Chicago and one scene involves driving through a mall as the brothers try to reach the concert in time to play, collect the cash and save the orphanage. There is plenty of music performed throughout the movie with spectacular footage of Cab Calloway at the concert in Chicago. Aretha Franklin gives the audience a stunning performance, in the restaurant she and her husband own, when the Blues brothers come to get her husband, Matt Murphy, to rejoin the band and leave the restaurant business. Other musicians in this movie include B B King, James Brown, John Goodman, Murphy Dunne, Johnny Lang, Joe Walsh and others. Several have musical parts while other stars like Steven Spielberg have other parts. The Blues Brothers did location shooting at Danville and Chicago, Illinois. Daley Plaza and the Dixie Square Mall of Harvey, IL were two important shooting locations for this movie. Daley Plaza was the site of the Bluesmobile driving through the building and the Dixie Square Mall chase scene is hilarious. Besides shooting in Illinois, the movie has location shots in Milwaukee, Wisconsin. Blues Brothers 2000 is currently available to watch and stream, buy on demand at Vudu, Google Play, FandangoNow, iTunes, YouTube VOD online.